At Temple Allen, we work closely with clients so that we can maximize the benefit our equipment brings to their operation. Working closely helps us develop a deep understanding of their process challenges and often inspires us with ideas for new features and capabilities. This is particularly true as our clients expand the range of applications where EMMA is put to work. 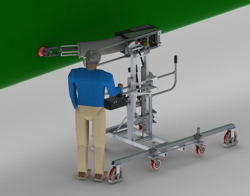 All EMMA systems feature intuitive joystick control that allows the operator to guide the End-Effector as needed, e.g. dwelling longer on patches of thicker paint or spots of filler. Clients with applications requiring full degloss and a uniform traverse rate, particularly on larger and unobstructed surfaces, have asked us to incorporate a feature that lets EMMA perform the back-and-forth sweep motion automatically without continuous operator input via the joystick handle. Instead, operators can now activate our new Auto Sweep feature via a switch on the Joystick Box. An OPC (Operator Presence Control, a.k.a. “deadman switch”) is now available to simplify shutting off the sander(s), and eliminates the need for the operator to toggle the main switch. While the existing “sander on” switch is still part of the control circuit, a trigger on the joystick handle starts/stops the sander when engaged/released. Even the best industrial pneumatic vacuums take some time to empty when full, especially considering the contents often require personnel to follow HazMat procedures. This is less of a problem for applications that call for minimal material removal, but for applications which generate more dust (e.g. full depaint), frequent emptying could adversely affect process time. 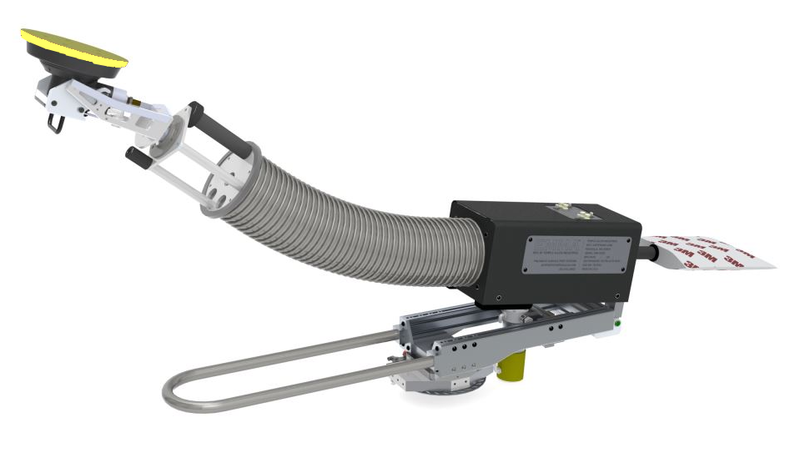 To address this, we now offer an new dust collection system that features a venturi that exhausts particulate directly into easily-disposable 3M Clean Sand Filter Bags. Swapping filter bags is as simple as removing and capping the full bag and putting a new one on. Any full bags can be disposed of after the sanding process is complete. 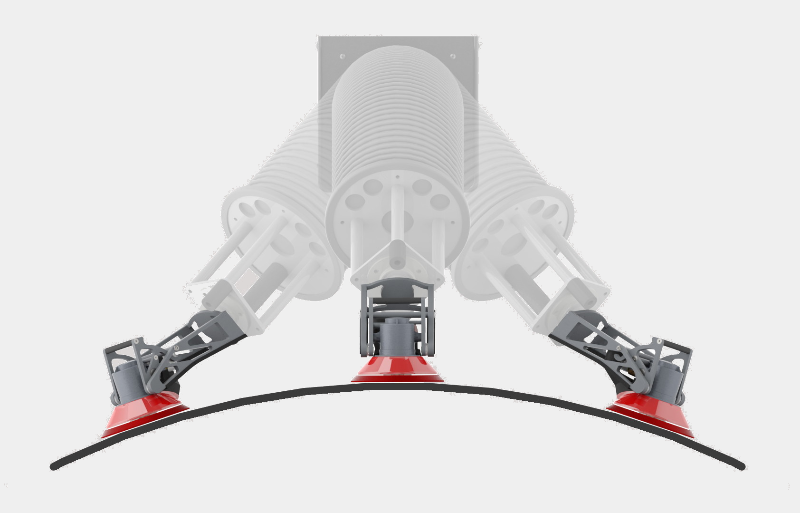 The venturi has no moving parts, and because each bag is its own fresh filter, there is no chance for dust capture efficiency to decrease over time. When sanding against a vertical surface, the applied force naturally wants to steer the EMMA away from the workpiece as the operator rolls forward, particularly on floors slippery with dust. Our first solution was a repositionable track equipped with tacky foam pads at each end to prevent sideways movement, and was designed for depaint or other applications with a low traverse rate. Quick scuffing applications, however, needed a way to minimize repositioning time, and we have addressed this by substituting wheels for the foam pads, which provides the directional stability required, but allows the EMMA to roll straight uninterruptedly alongside an aircraft fuselage, a wind turbine blade, or a train car body. Earlier generations of EMMA ground-deployed units came standard with foot-activated directional wheel locks (locking the wheel in one of 4 cardinal directions), which facilitated linear motion alongside the part being sanded, stabilized the EMMA during operation, and made the system easier to maneuver. Because some operations on larger parts require the operator to unlock the wheels to realign with the gradual curve of the fuselage or wind blade, Temple Allen now offers this same locking and unlocking functionality directly from the joystick control box via a pneumatic switch to simplify repositioning and improve process time. 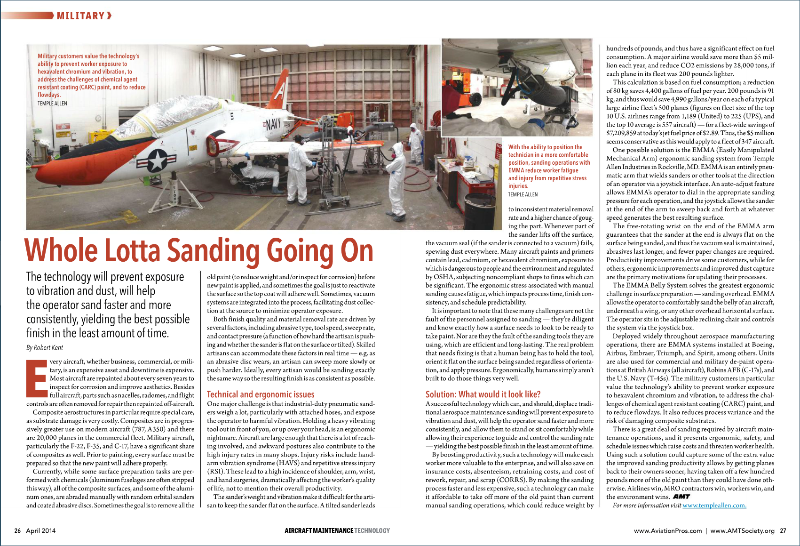 Aircraft Maintenance Today Magazine has just published our analysis of the many challenges of aerospace sanding operations, and how EMMA helps solve them, in their April issue. You can read the dual-page spread on pages 26-27 here. AviationPros.com – posted details on our Wing Top Sander and Helicopter Blade Prep systems.